Apple CEO Tim Cook gathered a handful of select journalists into the so-called “Townhall” room at the Apple HQ in Cupertino. Interest in this event had reached a fever pitch with most of the world expecting a new iPhone to be launched, “iPhone 5”. It so turns out that there WILL be a new iPhone, but as if to mock the pundits it is not called number 5, but 4s. But first – while everybody started getting nervous – Cook and team told us how well Apple is doing. Let’s review the important announcements. Two new stores (6 total in China alone) are serving as a poster child on the enormous momentum Apple has been gathering in Asia. OSX Lion has been downloaded over 6 Million times so far, 80% more than the predecessor. It reached 10% user adoption in 2 Weeks, a tenth of Windows 7 (20 Weeks). Year over Year the Mac outgrew the PC market by almost 6 times (23% versus 4%) and this has been going on for 5 years now. Macs have now around 58 Million users worldwide, giving it 23% market share in the US. The iPod was launched 10 years ago and became the #1 music player, over 300 Million iPods have been sold so far. 45 Million in the last year, half of which were purchased as the first iPod. “This remains a very important business to [Apple]”. “iPhone, this could be the reason why the room is full today”. More than half of all iPhones ever sold have been iPhone 4 making it the most sold smartphone. Generally owners of an iPhone 4 are more satisfied with they device than any other mobile phone. 5% of all phones sold (not just smartphones) are iPhones. Apple is not looking at smartphones only because they think that all phones will become smartphones over time. Apple has reached the 250 Million iOS devices sold mark. 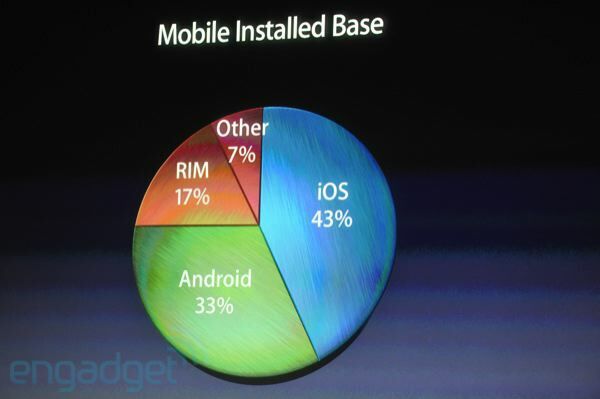 Market share is now at 43%(Android 33%, RIM 17%). iOS also accounts for 61% of mobile browsing, so apparently customers like the experience. More than a billion apps are now being downloaded per month. Scott Forstall then launched the new Cards.app which allows you to create greeting cards on your iPhone, Apple will print and mail it for you to a physical address. $2.99 in the US, $4.99 mailed wordwide. It is unclear whether this app will actually be available for customers outside of the US. iOS 5 will be publicly available as a free download on October 12th. The new Find my Friends app shows you family and friends who share your location with you. You can either share permanently or set up a temporary event after which the location sharing stops automatically. Parental controls allow for forcing location sharing on their offspring and control who may know their location. iTunes Match allows you to legalize your whole pirated music collection at an amazing price: $24.99 per year subscription. It scans and matches your library against iTunes music. What it does not find it uploads. And then you can stream all your music on any of your devices. iCloud will launch the same day iOS 5 launches, October 12th. iTunes Match at the End of October in the US and they are working on adding additional countries before the end of the year. 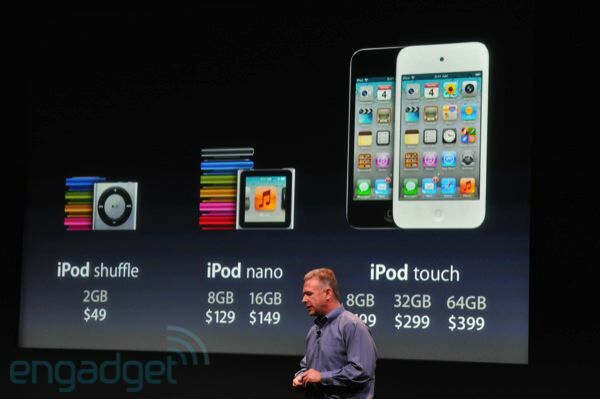 Both iPods are getting slightly cheaper. It appears that the iPod classic is no longer in the picture. After 52 minutes we finally got to the interesting part, the new iPhone. Outside the same as the iPhone 4, inside completely redesigned. Signal Processor on A5 can do face detection of up to 10 faces, fast photos. 1.1 seconds to first photo, 0.5 seconds to next photo. Of course all with iOS 5 and iCloud integration out of the box. You activate Siri by holding down the Home button. Then you ask a question like “what will the weather be like today”. Siri figures out the meaning of your question gives a short answer and shows you some details. This is very useful to ask questions which you would have to tap quite a bit to get to otherwise. Like asking what the current time in another city is. This feature is both integrated with most of the built-in apps, as well as some external services, like for example Yelp to find restaurants. 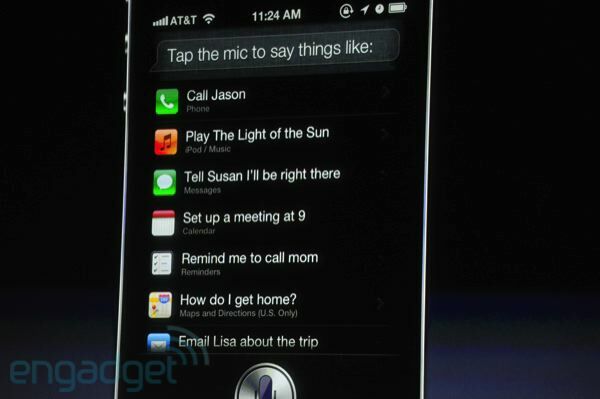 When in your pocket you can have Siri read messages to you. Siri keeps context so that subsequent questions can be answered more intelligently. You can check your calendar, schedule meetings, reply all hands-free. It also learns for example who “my wife” is. Searching is integrated with Wikipedia and Wolfram Alpha. So you can search for terms in Wikipedia or get answers like “how many days until Christmas”. Siri also allows for dictation into any text field that shows a keyboard. There is a new microphone icon to the left of the virtual space bar for that purpose. Dictation is done on Apple’s server (over 3G and WiFi) as opposed to voice control which happens on the device. It launches in English, German and French and they specifically stated multiple times that it is BETA. Meaning that they don’t feel it is fully done and will be adding more languages. Unfortunately there is no public Siri API for apps just yet even though there must be a private API that powers Apple’s built-in apps. We were told to file a Radar for that by a developer working for Apple. Apple is keeping the iPhone 3GS (8 GB) as a free option (with contract) for providers, iPhone 4 will be available only with 8 GB for an entry price option and the iPhone 4S will be the premium phone. With this line up Apple hopes to have an iPhone for every kind of customer segment, hoping to steal more market share from the entry-level priced Android phones. 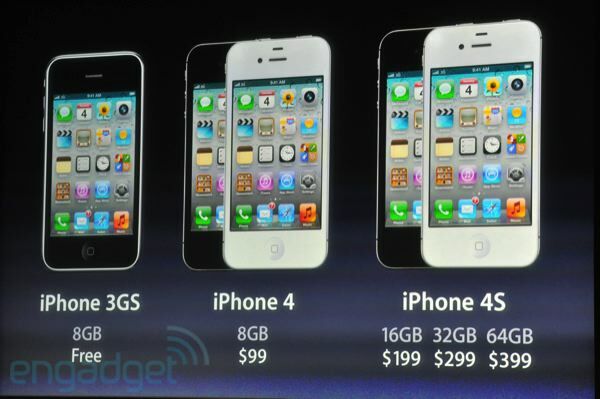 iPhone 4S launches in US (Sprint too! ), CA, AU, UK, FR, DE and JP on October 14th. 22 more countries (including Austria) on October 28th. By the end of the year in over 70 countries. So we actually did get a next generation iPhone, it is just not called iPhone 5. With the new iOS version and iCloud and the broadened lineup Apple is definitely out for broadening the footprint of their products in the market. My congratulations to all these happy wives who will now get a handed down iPhone 4. And congratulations to us iOS developers who see their platform flourish and finally get a shiny new toy. We have not even scratched the surface of the kind of synchronization and features that iCloud makes possible and easy for us. Overall Tim Cook did a good job as new Apple flag holder. I wish for him to get a bit more relaxed and humorous in the future, he was somewhat stiff and overly serious as compared to the other speakers. But nothing a bit of training could not fix. Apple is safe. No longer in the picture, but still sold for those that do want one. I guess this is the reason why we don’t have an API yet.